It is so much fun having these puppies around. I can only imagine what it will be like when they have their eyes open and they are running around. They got their dew claws removed on Tuesday…poor babies. They are all starting to get fat little bellies though. It appears to me that they are all healthy as well as mom. She is eating like a horse and is such a good mommy! Here are some updated pictures of the newest 9 additions to the Como family (for the time being)! >Well, we lost one of the pups this morning so our count is down to 9. He was the last one born and I don’t think he ever did very well. He was spaced out quite a bit from the puppy born just prior. The rest of them seem to be doing well though! They are already getting fat little bellies. I will post pictures tonight if I get a chance. We are all running on fumes around here trying to sleep but worrying about puppies! Abbi is finally getting some rest today. At the moment not one of them is making a peep! She is getting some good sleep! >We had one more black female born during the night and another yellow born this morning. The yellow is a male so the count is now 10! Hopefully she is done! 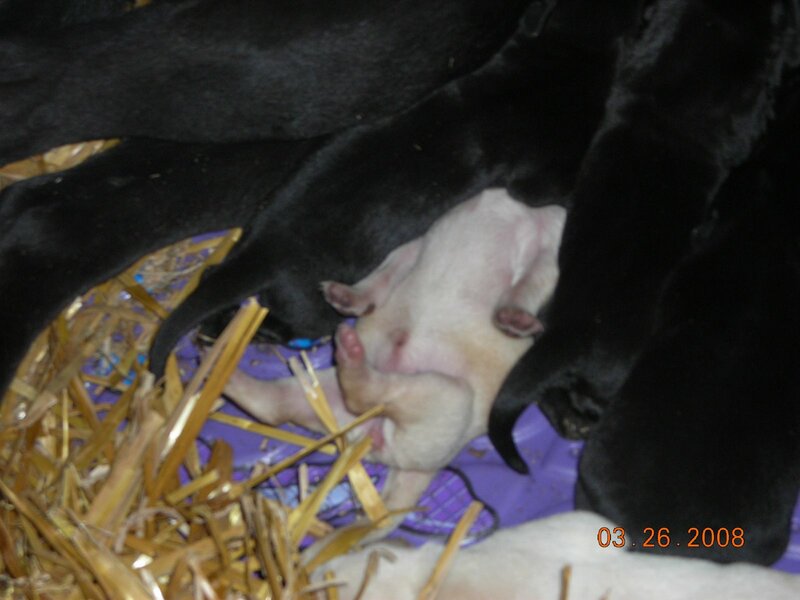 >Well the puppies are here…right now we have 8 puppies, 5 black males and 2 yellow females. She started having them at about 7:15 this morning (the first little boy was born before we were up) and she had the last one at 8:30 tonight. Mike and I spent the day running back and forth from Easter at Grandma Sue’s to our house every hour or so to check on Abbi. The majority of the puppies were born while we were around. The boys are in complete awe of this whole experience as are Mike and I, I would have to say. It is pretty amazing to watch all this happening. Abbi has been an amzaing first time mommy…she knows just what to do! It appears that there may be one more puppy in there so we are waiting to see. By morning I am hoping that she is done and feeling not quite so exhausted! She looks just wiped out right now. I have a baby monitor set up for tonight so that I don’t have to come check on her every 2 hours! I have 9 kids tomorrow at daycare so it will be a very hectic day! Anyway, here are some pictures…more to come! >Our dog, Abbi, is showing signs of having pups very soon. She has been staying in the pool we bought for her to whelp in and appears to be shivering. Poor thing seems miserable! More details when we have some puppies…and pictures! The kids have had a blast having her in this week so they will surely be pumped when the puppies arrive. >Well, it is official…we will be having puppies at the end of this month. Our dog, Abbi, is definitely pregnant! We had her bred at the end of January and it takes 63 days for dogs to have the pups. So we should have them right around Easter. If she goes the 63 days it will be the Tuesday after Easter. This will be her first litter so it will be quite an experience for us! Mike has never had pups before so it is a totally new experience for him. The boys will probably want to keep them but NO WAY says mom!